Discussion in 'News and Announcements' started by Roshen, Sep 22, 2015. It's that time again. 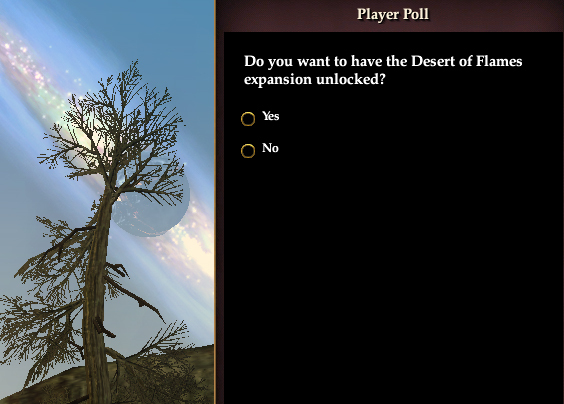 Will you vote to unlock the Desert of Flame expansion content on the Time-Locked Expansion server YOU play on? This vote is in-game, and will run on Stormhold and Deathtoll until noon PDT on Tuesday, September 29, 2015. Just look to your mailbox for this vote (and zone or relog if you have any issues having this vote display). Can you tell me please. If I'm playing on both servers, can I vote 2 times or it's one vote per account? That is a great question. Because their explanation is one vote per account, but being that each server is counted separately you should have a vote on each. The poll only shows up on the TLE servers. I feel like this thread needs a Desert of Flames original trailer! Niboota, Eles, Griffon Lady and 12 others like this. The votes for Stormhold and for Deathtoll are separate. One server could vote to advance, while the other could vote against. So if you play on both it would be one vote for your account on Stormhold, and one vote on Deathtoll. How long after the vote will it be till the expansion goes into effect? To vote 'yes' or not to vote 'yes'. I'm on the fence. Is there an option to vote 'present'? “To vote 'yes' or not to vote 'yes'. I'm on the fence. Yeah. It's called abstaining - a camp I'm in as well. Think of it this way: not voting essentially equates to a "no" vote. You two have time to think about it, but if it's a landslide like last time, you may not have the full week to decide your vote. Will be interesting to see how this turns out. Not a gambling man, but I have an odd feeling we'll hear a resounding NOOOO. At least on the PvE one. How do we know that our votes actually matter? I don't see any live poling data or posts with results. Shhh, you're not to speak of such things. No one is allowed to know the votes don't matter and it's ultimately up to DBG. See you in Drunder! Having spent most of my time in EQ1 lost and wandering around the Desert of Ro wandering between the dock and the Orc Highway I can tell you without a doubt that to me EQ2 is a shell of its former self without the Desert of Flames EXP. hmm it's already Thursday, are they gonna let this vote last a whole week this time? “hmm it's already Thursday, are they gonna let this vote last a whole week this time?